The unspoilt village of Whittington lies in Lancashire's beautiful Lune Valley and is situated on the northern bank of the River Lune some two miles to the west of the popular tourist venue of Kirkby Lonsdale and the picturesque medieval Devil's Bridge. An ancient settlement, in 1066 Whittington was owned held by Tostig, Earl of Northumbria the unruly and rebellious brother of the Saxon King Harold. Tostig met his end in battle against his brother the king at Stamford Bridge. The village was listed in the Domesday Book of 1086 where it is referred to as Wititone. The village church of St Michael the Archangel occupies the bailey of a former castle.A church is believed to have stood on this site since around 1200. The oldest part of the present building is the tower, which dates to the early sixteenth century. The rest of the church was largely rebuilt in 1875 by the Lancaster architects Paley and Austin. 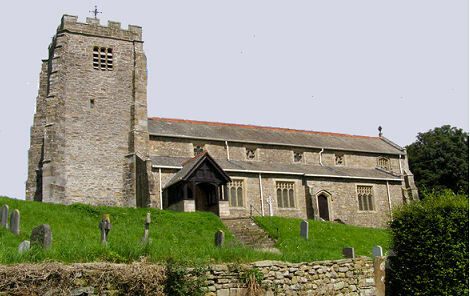 The building consists of a four-bay nave with a clerestory, north and south aisles, a south porch, a single-bay chancel with an organ chamber and vestry to the north, and a west tower. The church contains an elaborately carved chancel screen, the reredos is in stone and is also carved. The marble font is carved with panels containing tracery, shields and other forms of decoration and dates from the late nineteenth century. The Royal arms of King George III, displayed in the church overpaint the arms of King Charles II. 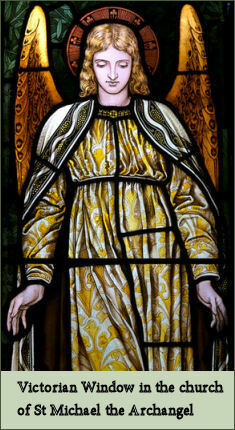 The stained glass includes three windows, including the east window, by Powell, dating from the late Victorian era. There are two windows in the south aisle by Kempe and Tower dated 1922. The churchyard has a sundial with a base dated 1641, which stands on the summit of the former motte. To commemorate the millennium, a mosaic depicting St. Michael the Archangel, designed and constructed by Maggie Howarth, of nearby Wennington, whose cobblestone mosaics are nationally known. The mosaic has been installed at the entrance to the churchyard. The cobbles which make up the mosaic were gathered from the River Lune by villagers. Whittington Motte is a late eleventh century earthwork motte and bailey fortress which consists of a mutilated oval mound circa 52 metres wide at the base standing some 3.5 metres above the crescentic bailey occupied by the church and churchyard. The church, with its graveyard has considerably altered the castle and there are now no visible remains of any encasing banks or ditches. There is a significant cluster of motte and bailey castles of early Norman date in the Lune Valley. The village was the birth place of William Sturgeon the pioneering inventor of the electro magnetic motor, who was born on 22nd May, 1783 at Whittington and died in 1850 at Preston. 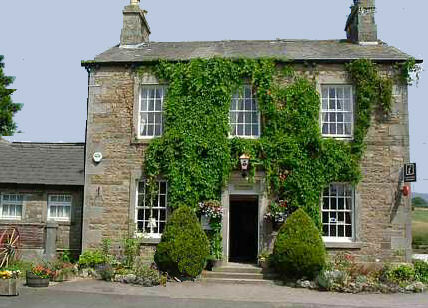 Whittington Hall is located to the west of the village, the hall was built between 1831 and 1836 on the site of an earlier house to a design by George Webster for Thomas Greene, M.P. 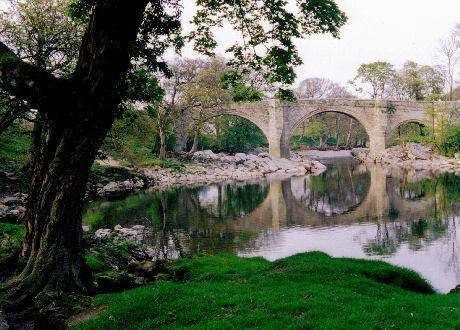 *Commencing at Devil's Bridge at Kirkby Lonsdale, from the west bank of the River Lune follow the path across the park signposted 'Whittington' across a park to the reach the A65. Cross the road and go through a n meadow and between houses and cross the B6254. Enter another field ,and proceed uphill, keeping the walled wooded area on your left. *Keep on over the brow of the hill and go straight ahead crossing two stiles. Turn left at another gap stile into the farmyard at Wood End Farm. Turn right along the track to Wood End Cottage. Go to the left in front of the cottage along an overgrown, walled path down to Sellet Mill. The path opens out by the mill race. * Turn right by the cluster of homesteads and proceed up the field, keeping the fence to your left, until level with the end of a garden. Go left through a yellow marked gate and walk straight across a small field to another marked gate followed immediately by a shallow stream. Bear right to go round Sellet Bank, aiming initially for the corner of a hedge under a row of pylons. Continue with the hedge to your right. *Cross a yellow marked stile on your right, then bear left round a wooded area. Facing Sellet Hall, turn right adjacent to the fenced driveway following the marker arrows, then keep on over the corner of the field to cross a stile and drop down a couple of steps to the road at a T-junction. Turn left along Hosticle Lane towards Whittington .
.* Proceed through a gate in the left corner and cross straight over two small fields to a stone stile leading to a narrow, walled lane that leads on to Main Street. Turn right, in front of a building dated 1875, and on through the village past the village hall and the Dragon's Head pub. At a sharp right bend on the edge of the village turn left along a sandy track, passing a farm and tennis courts. *Follow the lane as it bends its way between fields to reach a pair of gates. Go through the gates on the left. Bear left to pick up the riverside walk - the Lune Valley Ramble - back to the A65 bridge at Kirkby Lonsdale. Go through a gate and up steps to the left of the parapet. Cross the road, drop down the other side to cross the park to return to the starting point. The Crook O’ Lune, situated near Caton, a famous beauty spot, where the River Lune meanders in a large curve through tree-lined banks, the view up the valley is superb. Wray- famous for its Scarecrow Festival,which attracts tens of thousands of visitors each year. Hornby Castle- once painted by Turner, is an imposing Gothic structure which dominates the landscape from its commanding position above the River Wenning. Ashton Memorial in Williamson Park, Lancaster was commissioned by James Williamson, Baron Ashton as a tribute to his second wife, Jenny and was built between 1907 and 1909.